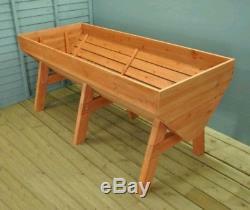 Product Description Now you can grow your vegetables the easy way, with the Veg-Trough planter. Made from treated timber, this unique raised bed provides the ideal base for your vegetable garden. Specially designed to provide a comfortable working height, the Veg Trough is ideal for creating a vegetable plot that is easily managed without bending over (great for those with bad backs) while keeping the crops safe from pests. What's more, crops can be increased as the Veg Trough can be filled with compost to create the perfect growing environment - so you can be sure of a bumper harvest what ever the local soil conditions. The Veg-Trough comes to you part-assembled with a liner cut to size - you simply assemble the table, place your liner inside and position your Veg-Trough in a sunny spot. Fill with your choice of drainage material, such as shingle or broken pieces of polystyrene, then soil or compost. Features a growing area of 1.4sqm Helps keep pests (like rabbits and slugs) at bay Can be used in your patio or greenhouse, or anywhere in your garden Height and design are well suited to allow easy wheelchair access Treated timber is suitable for a growing environment Holds 350 litres of Compost Box Contains 1 x Veg-Trough 1 x Instructions 1 x Liner FAST DISPATCH. The item "E9 Large Raised Bed Garden Trough Planter Veg Flower Plant Pots In Decking" is in sale since Wednesday, December 13, 2017. This item is in the category "Garden & Patio\Plant Care, Soil & Accessories\Baskets, Pots & Window Boxes". The seller is "r-.-smith5" and is located in Cradley Heath. This item can be shipped to United Kingdom, Antigua and barbuda, Austria, Belgium, Bulgaria, Croatia, Cyprus, Czech republic, Denmark, Estonia, Finland, France, Germany, Greece, Hungary, Ireland, Italy, Latvia, Lithuania, Luxembourg, Malta, Netherlands, Poland, Portugal, Romania, Slovakia, Slovenia, Spain, Sweden, Australia, United States, Canada, Brazil, Japan, China, Israel, Hong Kong, Norway, Indonesia, Malaysia, Mexico, Singapore, South Korea, Switzerland, Taiwan, Thailand, Bangladesh, Belize, Bermuda, Bolivia, Barbados, Brunei darussalam, Cayman islands, Dominica, Ecuador, Egypt, Guernsey, Gibraltar, Guadeloupe, Grenada, French guiana, Iceland, Jersey, Jordan, Cambodia, Saint kitts and nevis, Saint lucia, Liechtenstein, Sri lanka, Macao, Monaco, Maldives, Montserrat, Martinique, Nicaragua, Oman, Pakistan, Peru, Paraguay, Reunion, Turks and caicos islands, Aruba, Chile.